How amazing it is to see the weather warm up, the ice and snow melt and hear the birds start chirping again. We were on our way to drop Lil A to his pre-school last week when he shouted "grass, grass". We could see grass peeping through the snow and ice and he was as amazed as we were to see it. What does spring in your part look like? I have two Ottolenghi books - Jersualem and Plenty - and almost everything that we have made from it has been a hit. 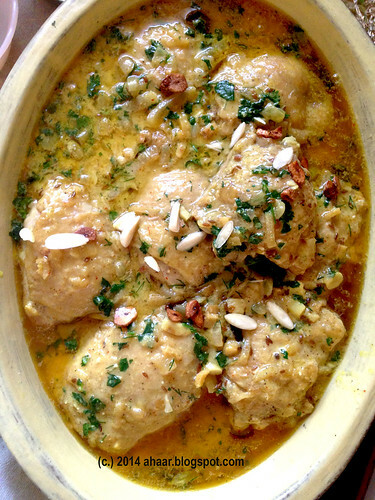 Recently I made this chicken which is cooked with yogurt, almonds and rosewater for some friends for dinner. Made some changes to the recipe, added some bay leaves to the spices, added some fresh herbs and fried garlic at the end and was pleased with the result. Salt and pepper the thighs and brown them for 2-3 minutes on each side. Take them out. 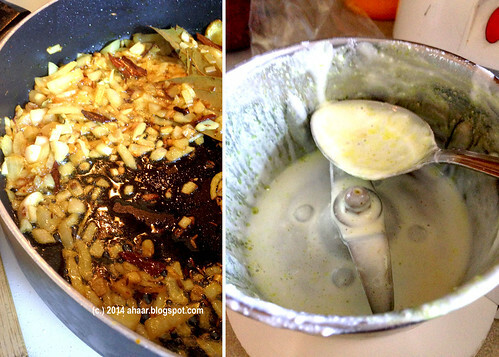 Then in the same oil add the onions, ginger, lemon, cinnamon, cloves and cardamom, salt and the garlic. Saute for 2-3 minutes. Then add the chicken back in and let it cook on low medium heat, covered for 15-20 minutes. Take about 5 almonds out and then grind the rest of the almonds to a fine powder, then to this add yogurt, cream and rosewater. Once it's all mixed together, take a little bit of the chicken sauce and mix it with the cream sauce. Slowly, add the sauce in the chicken. Let it cook on low for 5-10 minutes. Heat a teaspoon of oil and add the garlic slices when the oil is hot. Let it cook for a minute as it browns and take it off the heat. 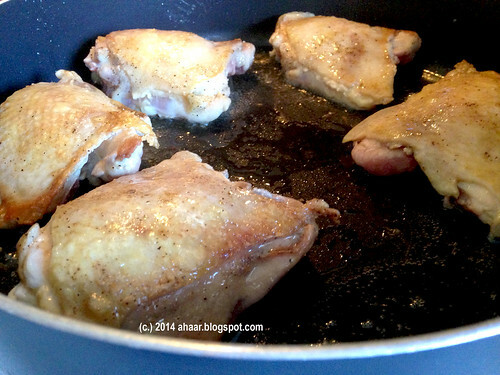 After you plate the chicken, add the garlic slices, sliced almonds and the herbs. 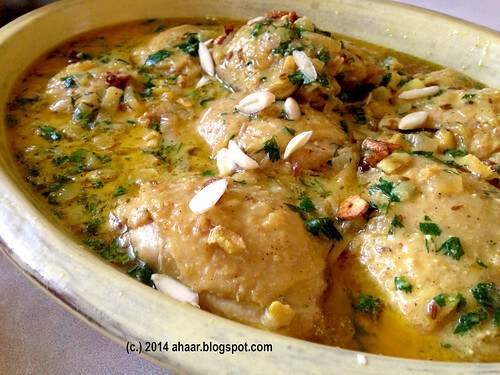 Serve with rice, parathas, naan or rotis, or even pasta. I started writing this post last week and finished today. Happy Holi everyone. Playdates are a lot of fun for Nicole and me. It has become a ritual since we began in 2011. Yes, it has been a year since the last one. But we had an ambitious plan for this one, to make sweet potato gnocchi. The other fun part of these cooking sessions is seeing the kids together. 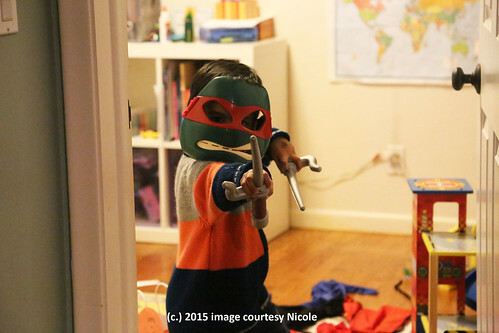 Lil A and Lil N are beginning to play together and they had a lot of fun dressing up as superheroes and ninja turtles. To make things easier, we made some sides beforehand and then got together to make the sweet potato gnocchi together. We chose the recipe from epicurious and followed it except for reducing some of the butter, cheese, sage and taking out the nutmeg.